This No-Bake Oreo Chocolate Tart is absolutely AMAZING. It’s quite easy to make this tart. No oven is required. 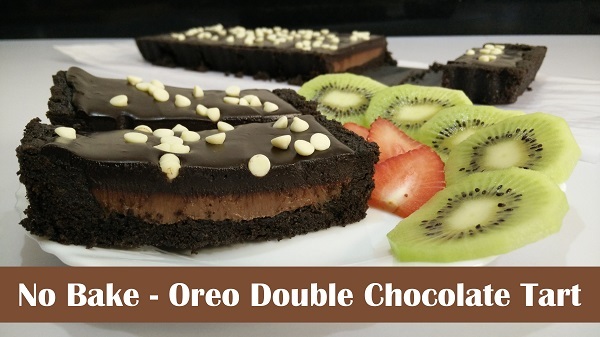 This Tart is made from Oreo, Milk Chocolate and Dark Chocolate and the crust is made with whole Oreos. 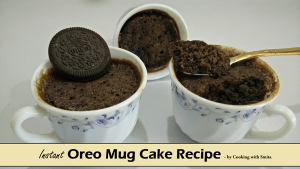 If you love Oreo and Chocolate, I’m sure you will love it too. Process Oreo cookies, with filling, in the food processor until finely ground. Add melted butter and mix till combined. Take a Tart Pan (I have used 5” x 14”) and spread ground cookie mixture evenly. Press using the palm of your hand or spoon, shape it so that it covers the bottom and sides evenly. Keep in refrigerator for 2 hours. Heat fresh cream (DO NOT boil) and pour over Milk Chocolate and stir until the mixture is smooth. Pour the melted chocolate over chilled Oreo crush. Heat fresh cream (DO NOT boil) and pour over Dark Chocolate and stir until the mixture is smooth. Pour the melted Dark Chocolate over the layer of Milk Chocolate. Sprinkle some white Choco chips. Keep in refrigerator for 6 – 8 hours. Remove from tart pan and cut into desired size pieces. Enjoy No-Bake Oreo Chocolate Tart.